RSC Auto ID Distribution. Systemy znakowania i etykietowania. We are extremely proud that we can inform you that we have joined the group of producers who are taking action to protect the environment. Obtaining the certificate is the culmination of our activities and modern production processes taking place in our company. They are a signal that environmental protection is not indifferent to us. 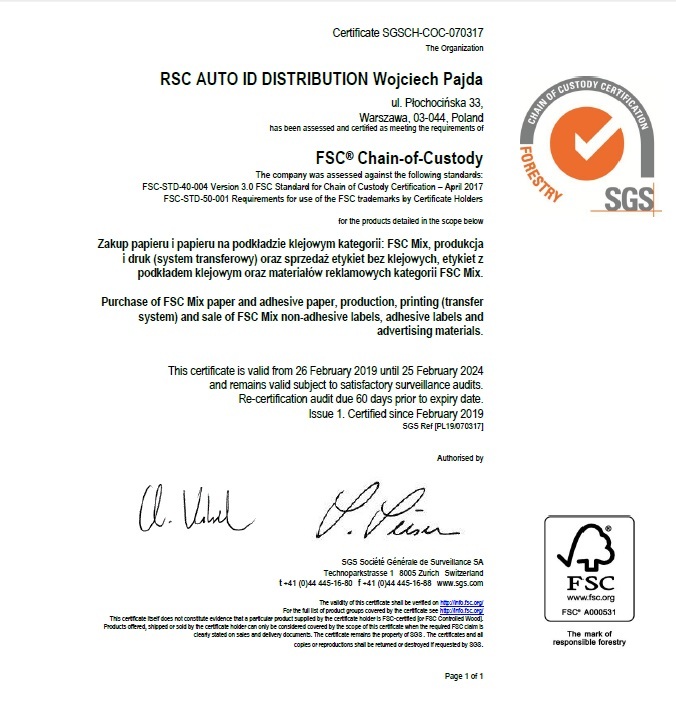 The certificate below confirms that our production chain, from the production of labels at all stages of printing to the logistics stage, is complete and meets the FSC® standards. By implementing FSC® standards in our company, we join the activities for sustainable forest management. Forest Stewardship Council® (FSC®) is an international public service organization that was the first to develop, implement and further develop a certification system for sustainable forest management. The 11th International Packaging Fairs Packaging Innovations will take place soon on April 2-3, at EXPO XXI Warsaw. This event has an established market position, which is visited by thousands of guests each year from Poland and abroad. Within two days you can get to know the offer of over 200 exhibitors and take part in numerous meetings in the workShops zones. The entire industry in one place! Packaging Innovations is a great opportunity to establish valuable business relationships. This is the greatest value of the event. This is confirmed by both exhibitors and guests. Experts who conduct training in workShops zones also emphasize that their listeners are people with extensive experience who always ask customs questions. The workShops zone this year will cover over 30 meetings being the essence of specialist issues and a thorough case analysis. We invite you to our stand no. D6. We are waiting impatiently for you!